Description: Sexes similar. Breeding plumage lacks spotting on flanks; only a tinge of rust coloring on crown, ear patch and scapulars and grayer above than other “peeps”. Wing tip does not extend beyond tip of tail. Black feet and short, stout black bill. Winter plumage is duller gray and never showing faint streaks on breast. 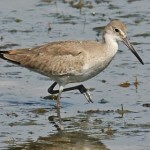 Juvenile is similar to winter adult but has stronger eyebrow and crown. 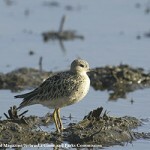 Habitat: Mud flats, shallow ponds, sand bars, and open shorelines. Rarely observed in dry fields or wet grasslands. Where in Nebraska: Common spring and fall migrant, becoming less common in western Nebraska. 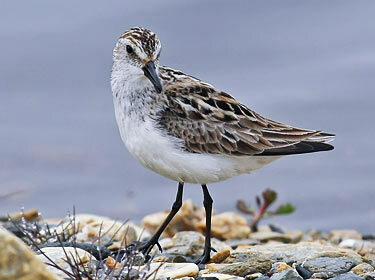 Fun Facts: Semipalmated Sandpipers get their name “palmated” from the webbing between their toes. 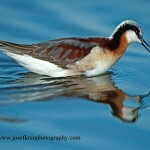 Only Semipalmated Sandpipers and Western Sandpipers share this trait.